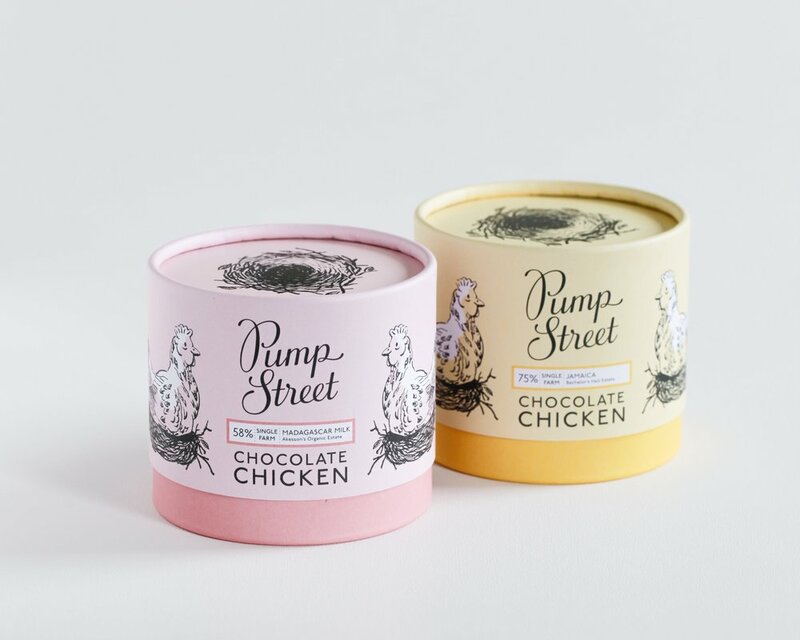 The Pump Street Chocolate Chickens were originally packaged in cellophane with a ribbon tie. Just like a chocolate egg, the hollow chickens are delicate and so our brief was to design packaging which would protect them whilst also making them suitable for gifting. The chickens are hand poured from molten single origin craft chocolate and are made from start to finish on site in Suffolk. We thought a cylindrical ‘hat box’ style was the perfect shape to protect and show off the chickens and their little nests! The colour inspiration came from the chocolate used to create them - a yoke yellow colour palette for the single origin 75% Jamaica dark chocolate chicken and a soft pink palette from the 58% Madagascan Milk.